Natalie is so happy!! Last week she got her first American Girl doll and she literally hasn’t let go of her since. The only time I could RIP Miss Stacy out of Natalie’s hands was when we went to the water park. A match made in doll heaven. 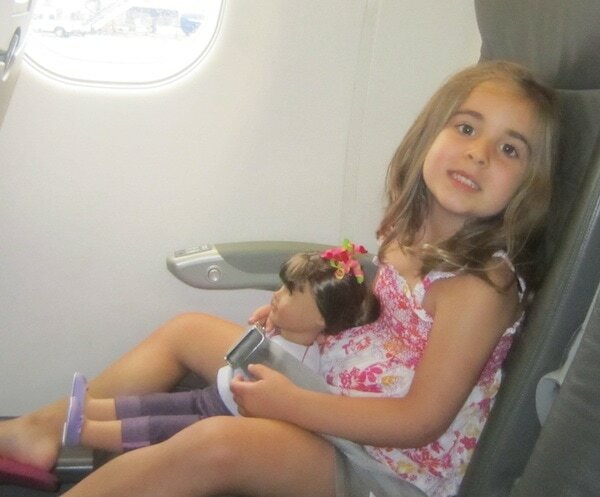 Does your daughter have an American Girl doll? I am dying to go to the store and check it out. I heard you can have TEA with your doll. Natalie cannot WAIT! Awww, she looks so happy! Good for her! I took my girls to AG Cafe in NY right after Xmas…it was so much fun. My 4 yr old got the twins and my eight yr old got Rebecca. We ate at the cafe and it was awesome! They even have little doll chairs that clip to the tables for them to sit in! And you can serve them tea….it was heaven! The food was delicious too! Pink lemonade! I’ve always wanted an American Girl Doll!!! (I’m 22)… I can’t wait until I can get m (future) daughter one. And the name Ra-nee-na is adorable!